A great summer time dessert! 1 Heat oven to 350°F. Grease bottom and sides of 13x9-inch pan with shortening or cooking spray. 2 In large bowl, beat sugar, butter, vanilla and egg with electric mixer on medium speed, or mix with spoon, until light and fluffy. Stir in graham cracker crumbs, flour and salt. Reserve 2 cups graham cracker mixture. Press remaining mixture in pan for crust. 3 Sprinkle chocolate chips over crust; press slightly. 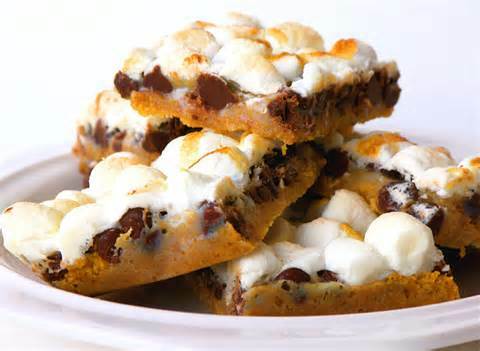 Drop marshmallow creme by tablespoonfuls over chocolate chips. Wet back of tableware spoon and use to lightly spread marshmallow creme. Sprinkle with marshmallows. Sprinkle with reserved crumb mixture; press lightly. 4 Bake 17 to 22 minutes or until marshmallows are puffed and light golden brown. Cool at least 30 minutes. For bars, cut into 6 rows by 4 rows.